Cotton Belt 4-8-4 No. 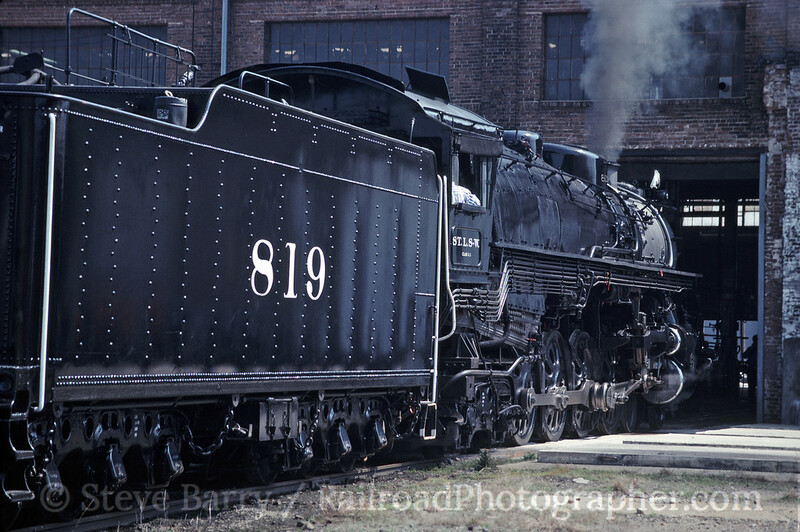 819 -- the classic example of a locomotive all dressed up with no place to go. The Northern-type locomotive was built in the shops of the St. Louis-Southwestern Railroad (better known as the Cotton Belt) in Pine Bluff, Ark., in 1943, the last steam locomotive built by the railroad. It was to some extent a copy of ten Northerns that Baldwin had built for the railroad in 1930 (Nos. 800-809). Cotton Belt built five additional Northerns (Nos. 810-814) in 1937. The last five (Nos. 815-819) were slightly different from the rest, as they had steel number plates and numerals, and no chrome plating (war time restrictions were in effect). No. 819 served the Cotton Belt only slightly more than a decade, and was retired in 1955 and presented to the City of Pine Bluff to recognize the important role the town had played in the history of Cotton Belt steam. In 1983 the locomotive was removed from display and taken back to its birthplace, the Pine Bluff shops, for restoration as an excursion locomotive. It returned to service in 1986 and ran until 1993. 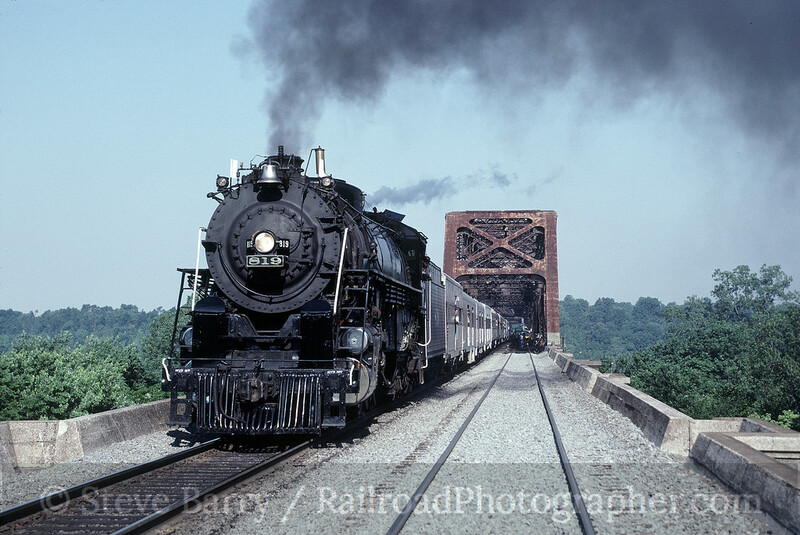 In 1990 it ran to the National Railway Historical Society convention in St. Louis, taking two days to get there. That's where our photos begin. 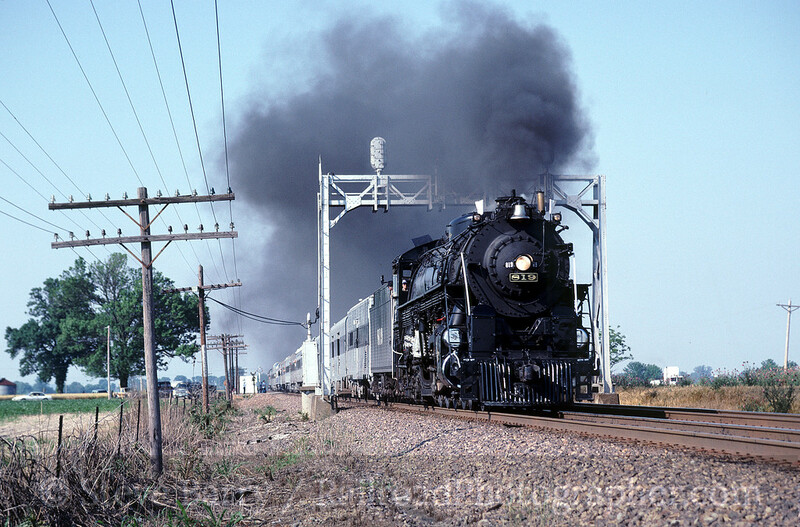 The first day (June 12, 1990) saw the train run from Pine Bluff to Illmo (Scott City), Mo., including a meet with a Cotton Belt freight at Bernie, Mo. (above). The next morning the photo line was huge at the Cotton Belt bridge over the Mississippi River at Thebes, Ill. Photographers were stacked about five high to get the shot. Fortunately, maintenance work had one track shut down (the equipment was parked on the bridge, so the photo line knew there would be no interference from trains) making for some room at the end of the bridge for a shot. From here the photo line quickly dispersed into all directions. The next time we caught the train was just up the road at the signal bridge in McClure, Ill. The train made several servicing stops along the way, allowing the photo line to skip ahead for additional shots (the train was authorized for 55 m.p.h., so the stops were a good thing). In St. Louis, No. 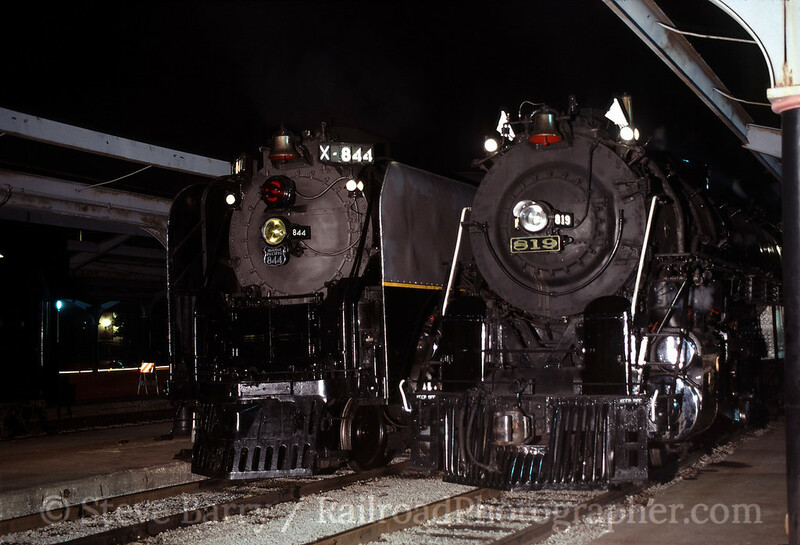 819 shared the stage with three other steam locomotives -- Norfolk & Western 2-6-6-4 No. 1218, Union Pacific 4-8-4 No. 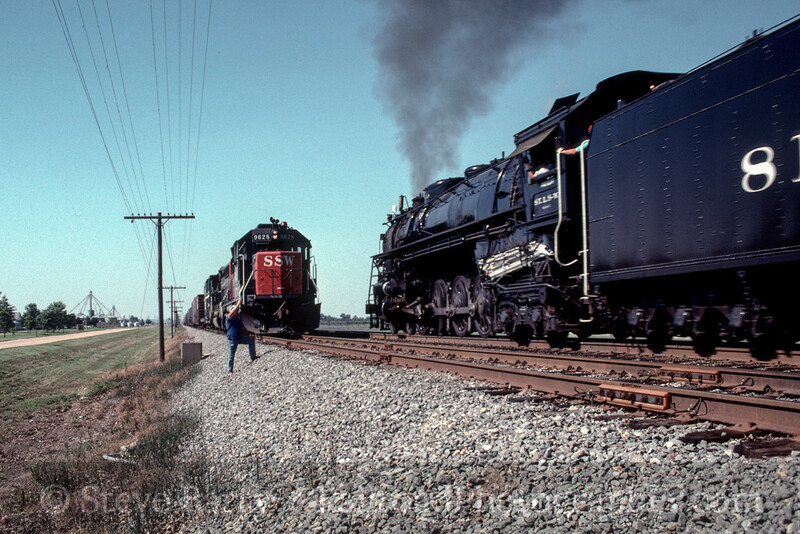 844 and St. Louis-San Francisco (Frisco) 4-8-2 No. 1522. The quartet was parked at Union Station for the convention, and each evening you could find one or more resting along the platforms.